Boot-optimizer RapidStart is slick and user friendly. However, aside from presenting you with statistics about how long it takes you to boot, it does little that you can't do yourself using the Windows system configuration tool and the services control panel. If looks were all there was to software, boot optimizer RapidStart would rock your world. Of course, using those tools requires a fair amount of Windows knowledge so RapidStart has merit for some users. The first thing RapidStart does is reboot your system and time the various programs and services that are loading at boot time. It then gives you the option to implement the program's recommendations (don't run, delayed run) manually using the aforementioned Windows tools, implement them using RapidStart's own item-by-item wizard, or have RapidStart implement them for you automatically. The last option, which is what non-techies will most likely want, requires purchase of the program for $20. My favorite RapidStart feature is the history of your boot times displayed in a nice timeline graph. It makes for interesting reading, however, to collect such things. 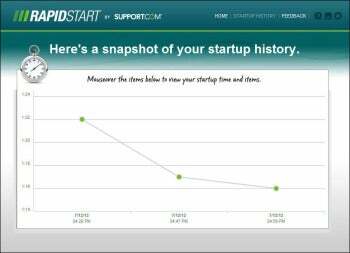 RapidStart installs a service, which though it does so minimally, uses system resources and CPU cycles on its own. Put another way, it uses some of the time it saves you. If you employ it, you might want to use it for a while, then uninstall. RapidStart does what it says it will do, and does it with a confidence-inspiring interface. That said, while it might help some less experienced users, advanced users needn't bother. This offering might help some less experienced users, but advanced users needn't bother.